We are the largest music school in Greenbrier County! Highest quality lessons for children and adults. Private lessons and group classes available. We will teach what you want to learn! This is your art, we help you find YOUR voice! With 13 teachers on staff we can teach everything from classical to heavy metal! $26 per week for 30 minute lessons & $48 per week for 60 minute lessons - for the serious student. All lessons are billed monthly. We teach the smallest ones in our mommy and me classes to age 99! Approx 35% of our students are adults! It's never too late! 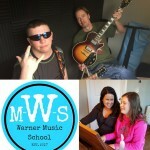 Let others know about Warner Music School Of Lewisburg. Did this teacher help you to learn? How long did you take lessons? Are you still playing music? Share any thoughts or stories you have so that others can know about this teacher!